Aircraft Lightning Protection Market size was valued at around USD 2.5 billion in 2017 and is estimated to exhibit over 5% CAGR from 2018 to 2024. Growing use of composite in airplane structural parts to lower weight and enhance fuel efficiency will primarily drive aircraft lightning protection market size during forecast period. An aircraft comprises of around 50% composites in its structure. The composites have low electrical conductivity that may cause serious damage during lightning strike. Further, the damage caused may affect airline operations causing service interruptions and costly delays. Airplane manufacturers install lightning protection materials to enhance conductivity and safeguard passengers. These factors will propel market growth over the study timeframe. Airline operators are incorporating state of the art materials, specialized computer systems & components offering higher reliability, longevity and light weight. The advanced systems are more susceptible to lightning damage. Technological advancement is prompting updates in safety regulations underscoring priority in protective equipment. Ongoing development will boost the market size from 2018 to 2024. Global aviation industry is witnessing growth in air traffic thereby increasing fight iterations. Rising consumer spending is positively influencing air travel resulting in product demand surge. Flight operators are lowering air fare to attract more passengers. Replacement of the in-service airplanes with new generation advanced airplanes are the key trends in aviation industry. These trends will fuel aircraft lightning protection market penetration over the forecast timeline. Lightning protection holds the largest share in the industry with increasing adoption of expanded metal foils, grounding wires and transient voltage suppressors in structures and avionics system to protect against strikes. The products have major application in electrically controlled systems including fuel valves, power feeders, electrical distribution systems and generators. Transient voltage suppressors are widely used for critical units such as actuator control, flight control and multiple engine controls. Detection & warning aircraft lightning protection market size will register sturdy growth with installation of sensor systems to detect bad weather ahead of flight course. The systems are designed to sense electrical discharge activity that are not observed on radar. Ongoing innovations for more sensitive and accurate systems will fuel industry growth. Civil segment leads aircraft lightning protection market size with over USD 2 billion in 2017 owing to prevailing civil aviation industry. Rise in discretionary income and per capita spending in middle class population are continuously attributing to growth in air passengers. Further, increasing cargo fleets is playing significant role in industry growth. Military segment will foresee strong growth with upsurge in defence spending. For instance, in 2018, the U.S. has planned to spend over USD 10 billion for stealth jets. Commercial aircraft accounts for over 35% industry size owing to continuously increasing aerospace vessel fleet to accommodate growing air passengers. The commercial air fleets face more bad weather and have more surface area as compared to other airplanes that require more conductive treatment. The strikes are rare however, the airplanes face them several times over whole service life. Business jets will foresee sturdy growth with globalization and rise in global trade. Regional jets aircraft lightning protection market will register 8% CAGR with growing preference towards air travel. The airplane manufacturers are optimizing seating capacity, operating range, cost & fuel efficiency and flexibility in route development to attract more airline operators. For instance, in February 2018, Bombardier planned to deploy over 40 CRJ200 jets in response to United Airlines plan to grow regional jet air fleet by up to 6% till 2020. Line-fit segment dominates the aircraft lightning protection market size with installation of protective materials in structures to maintain conductivity. The strikes hamper airline operations and may cause revenue loss. The manufacturers are designing components and systems to withstand and dissipate powerful discharge of strikes. Further, industry players are investing in R&D to promote electrical conductivity. Steps taken by OEMs to overcome shortcomings of composite materials will enhance industry growth. Retrofit aircraft lightning protection market segment will register gains at around 8% during the projected timeline. This can be credited to upgradation and modification of airplane components during maintenance and overhaul. The airline players are retrofitting the aging fleets of commercial and business jets. The operators continually test airplanes to ensure passenger safety and protect damage of sensitive equipment. OEMs such as Boeing are strengthening their MRO divisions to take most effective maintenance actions. The companies are setting up MRO facilities at low cost locations to attract more operators thereby positively influencing market size. 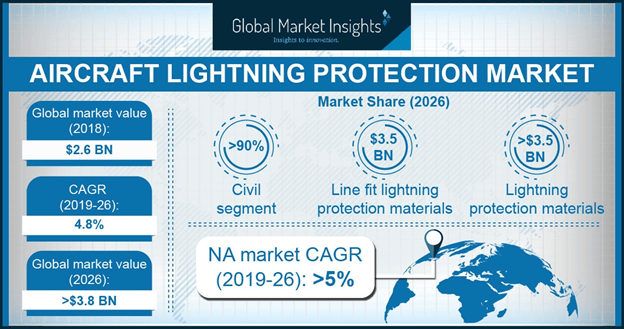 North America leads the aircraft lightning protection market size owing to presence of large number of airplane manufacturers including Boeing, Bombardier and Lockheed Martin. Florida face around 100 thunderstorm days per year that may hinder airline operations. The OEMs are employing protective materials in structure components to ensure passenger safety and meet regulatory standards. Europe will foresee healthy growth with regular innovation regarding lowering airplane weight to adhere to regulations regarding carbon emissions. Asia Pacific aircraft lightning protection market will witness gains at around 6% over the forecast period owing to constant increase in air passenger traffic. As per International Air Transport Association (IATA), the region will register around 4.6% growth in airline passengers with prevailing low air fare. Rise in passenger traffic will require more air carries and fuel product demand. Middle East & Africa is at nascent stage and will follow similar trend as Asia Pacific. According to IATA, the Middle Eastern country passenger will grow by 322 million per year till 2036 and propel industry growth. 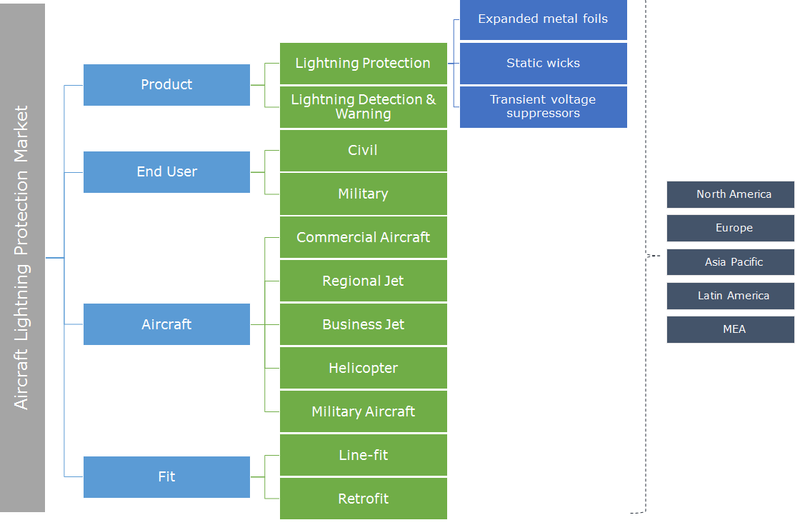 Major players in aircraft lightning protection market include Cobham, Honeywell, Microsemi Corporation, Dexmet Corporation, L3 Aviation Products, Saywell and The Gill Corporation. Other key players include Saab, TE Connectivity, Dayton Granger, Astroseal Products, Avidyne, Proteck devices, Exel Group, Niles Expanded Metal, Benmetal, The Expanded Metal Company and Wire Masters. Companies are adopting merger and acquisition strategy to enhance their market share. For instance, in May 2014, Cobham acquired Aeroflex, a microelectronic solution provider to strengthen its communication and connectivity sector and enhance its market share. The aircrafts face adverse weather conditions at cruising altitudes. The composite materials are non-conductive and gets damage during bad weather. Lightning protection materials are installed in airplane structure to enhance conductivity and safeguard aerospace vessel and passengers from strikes. The materials form ‘Faraday Cage’ around the airplane and lowers damage probability. Federal Aviation Administration (FAA), Society of Automotive Engineers SAE and Military (MIL) standards govern the use of protective materials. For instance, FAA, 20-136B provides requirement to protect airplane electrical and electronic system against strikes.